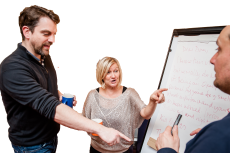 Our work is designed to develop or refresh the professional trainer's ability to run exciting and effective training programmes. Not surprisingly, training professionals spend a substantial proportion of their time training others. When trainers themselves receive training, it is usually aimed at familiarising them with the specifics of a new or revised module or programme. But what about a trainers' ability, confidence and motivation to deliver those training programmes effectively? What do the trainers get to help them kindle their creative spark? We tailor train the trainer programmes to your specific training needs. We always include material which will enhance the trainer's ability, confidence and motivation by developing and refreshing essential training skills. 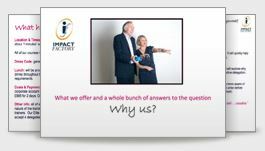 See what it takes to become Impact Factory Training Consultant running this programme. Our Train the Trainer Training work can be tailored as an in-house programme to address specific issues within your company.